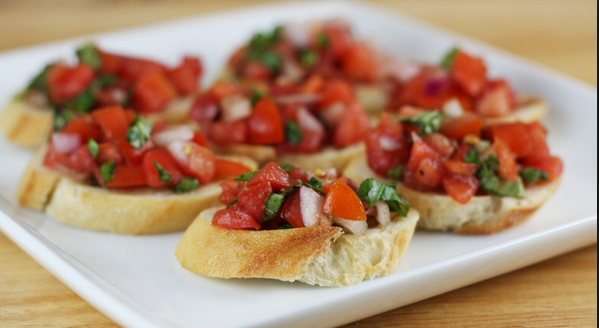 Bruschetta is one of my simple “go to” appetizers. I prepare it so often that I can’t believe that I hadn’t posted it on the blog yet! It’s a fresh and simple antipasto from Italy consisting of grilled bread rubbed with garlic and topped with olive oil, salt and pepper. Variations may include toppings of tomato, vegetables, beans, cured meat, or cheese. 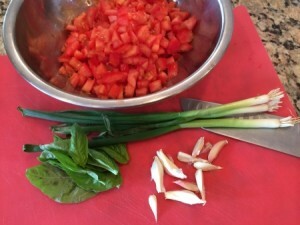 The most popular recipe outside of Italy involves basil, fresh tomato, garlic and onion or mozzarella, which is how I serve it. 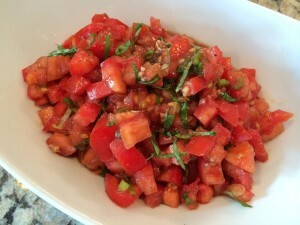 Because fresh tomatoes is the primary ingredient on a small crustini, I think it is a fairly healthy choice that is low in fat and is a good source of vitamin C, which I’ve read is critical for healing as it revs up your immune system and helps your body to recover faster from cuts and scrapes! I recently served it for a gathering. I suggest you serve it with your favorite baguette or slice of french bread. If you are having a gathering that you intend to leave food out, allow your guests to top their own crustini that is already toasted, and then rubbed with fresh garlic so it doesn’t get soggy. Top the toast and tomato mixture with shredded cheese! 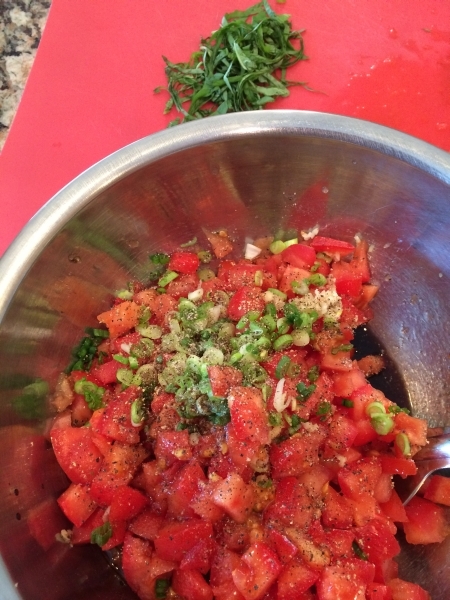 Chop the tomatoes into small cubes and discard any remaining seeds left on cutting board. Combine with other ingredients and mix gently. 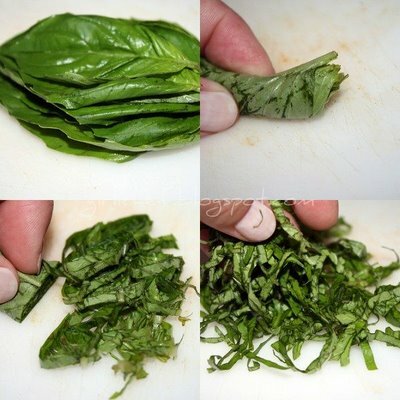 Add the julienned basil.